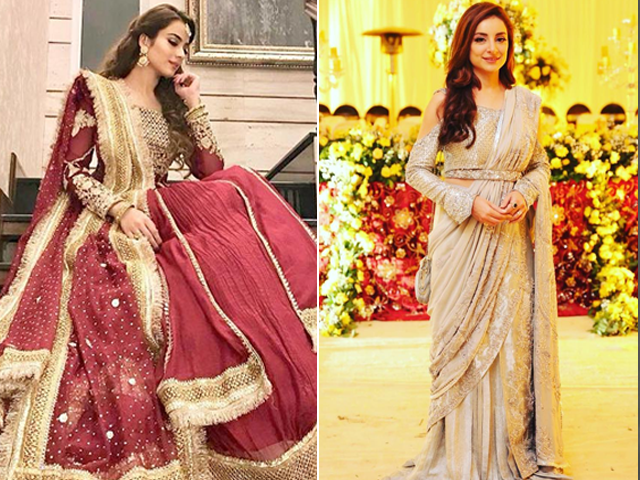 4 looks from Iman Ali's shendi that caught our eye! Supermodel Iman Ali’s wedding has been all the rage on social media this week. From an intimate mayoun to an extravagant shendi (shaadi and mehendi combined), the Mah-e-Mir actor’s event was attended by the who’s who of Pakistani showbiz industry. While the bride was dressed in a tradition yellow ensemble custom-made by Mehdi Couture, complimented by jewellery by Ali Javeri, there were a few other looks that caught our eye. Here are our picks for the four best dressed celebs at the wedding. The Jawani Phir Nahi Ani star turned heads in a silver, heavily embellished Nilofar Shahid sari. Sarwat let her outfit do all the talking, with no jewellery and minimal makeup. The Udaari actor opted for an Ali Xeeshan, maroon and gold lehenga choli which she paired with straight hair and chaand balis. Urwa’s outfit was colour-coordinated with her husband Farhan Saeed’s, who chose a maroon kurta pajama with a heavily worked pale gold jacket. The supermodel also looked stunning in a maroon and gold traditional Sarah Rohale Asghar lehenga choli. Unlike many other celebs, Alyzeh went with chunky kundun jewellery. We especially loved the teeka! It was definitely refreshing to see Uzma’s bright ensemble, once again by Nilofar Shahid. Clad in a multi-coloured outfit, the Jawani Phir Nahi Ani actor kept her makeup soft with a her hair neatly parted in the centre.